back in the day, i was a girl scout and i proudly sold girl scout cookies each and every winter. i had a few favorites, including peanut butter patties, but my absolute favorite girl scout cookie didn’t come out until i was no longer in scouting. they were called “iced berry piñatas” and they were absolutely delicious! they have been discontinued, so i decided to make up my own recipe for them. the secret to these delicious cookies is the toasted oatmeal, which gives them an unexpected crunch. to toast oats, preheat oven to 325° and spread oats in a thin layer over a jelly roll pan. bake 10-12 minutes, stirring frequently until a pale golden color and a nutty aroma is distinct. in a large mixing bowl, sift together the dry ingredients. when oats are cool, add them to the dry mixture, stirring well to combine. cream the shortening and butter with the sugars until the mixture is creamy and fluffy. add the vanilla, then the eggs one at a time while beating at medium speed. gradually add dry ingredients to the mix. roll dough into golfball size pieces, flattening each slightly, and place them on a non-stick cookie sheet about 2″ apart. they will not spread a great deal during baking. bake for 13-15 minutes in a 325° oven with baking racks centered. cool one minute and then transfer to a wax covered surface. 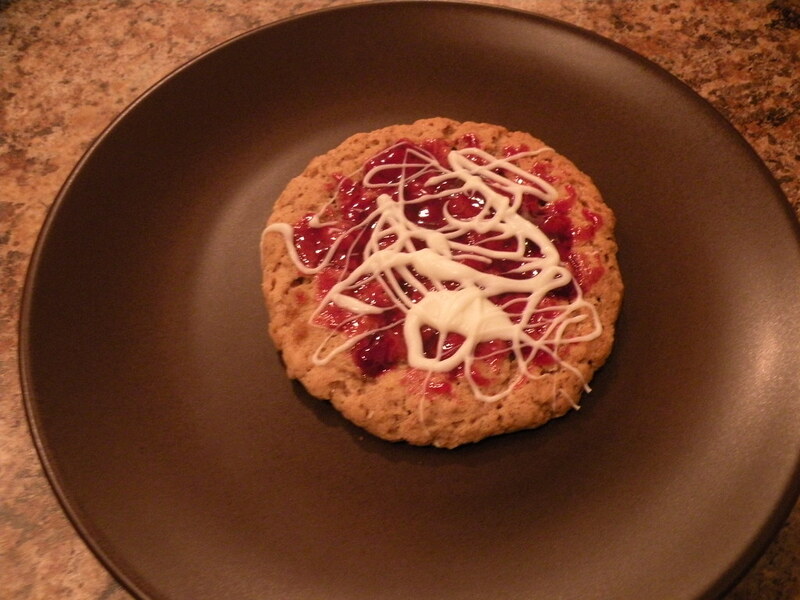 while cookies are slightly warm, drop 1/4 tsp of raspberry jam on cookie and spread around with a pastry brush. allow cookies to completely cool. melt almond bark according to directions and drizzle over cookies. allow to harden, and pack in a cookie container separated by layers of wax paper. Kristin, thanks for reading! I’m sure I polished off a box or two in my day, as well. I hope that you enjoy the recipe! I am going to try this recipe tomorrow – but I need to know how many cookies it makes?? One dozen? Two? More? THANKS!! Thanks for reading! The recipe makes 18 large cookies or 2 dozen smaller cookies. Please let me know what you think. I have a question, what could be used instead of almond bark? I am not a baker, but I am sure my husband will try to make these for me. I loved these cookies! Thanks for your comment! I would recommend using white chocolate chips, instead of almond bark. You could also try using semi-sweet chocolate chips, for a different taste. These are amazing! For years i’ve been harassing girl scouts for no longer selling these lol I also recommend dipping the bottoms of the cookies in the white chocolate also to make them more similar to the originals. Thanks, Jennie! I agree with the dipping, it makes it more like the original. I’m glad that you enjoyed the recipe. Thanks for your comment, Regina! PB Patties are my second favorite Girl Scout cookies, second to the Iced Berry Pinata… hope that you enjoy them.